We are proud to announce the recent acquisitions of two reputable Italian companies, Euroalpha and Euro Extrusion. Throughout its 80 years of history, a cornerstone of Sampsistemi has been its culture of innovation that focuses on consistent and continuous research and development aimed at satisfying the growing needs of its global customers. The acquisitions are in line with the strategy of Sampsistemi to focus its activities in each one of the three market segments in which it operates: drawing, rotating and extrusion equipment for the wire and cable industry. The combined resources will broaden the overall technical know-how, product range and service capabilities, and specialized teams will provide leading high value added solutions on a worldwide basis. Customers will benefit from a more focused approach, higher service level and a new technological boost able to reduce equipment total cost of ownership for wire and cable makers. Euroalpha, which includes the Euroalpha RM rotating machines division, is a highly experienced and respected manufacturer of wire drawing and stranding machines for the non-ferrous industry, well known for its innovative and reliable equipment, and deep process knowledge. The company has developed a remarkable know-how which complements Sampsistemi very well. Both companies’ product lines will benefit from development of enhancements, technologies and models due to the ability to leverage shared resources and cross-utilization of proven engineering designs. With an expanded and synergized global platform, the capability to serve global markets will be greatly increased. 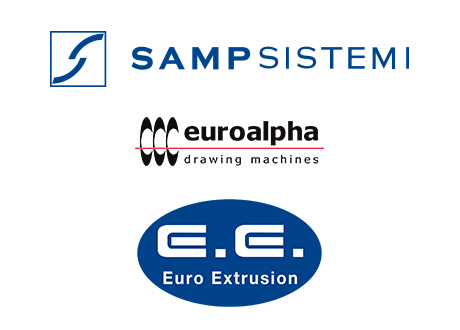 Euro Extrusion, with its vast experience in the field of lines for coating electrical cables, tire tread extruders and fiber optic cables lines, will contribute to improve the already well-established capacity and expertise of Sampsistemi in the extrusion sector. As a consequence, all R&D and production activities related to the extrusion applications have been moved to a brand new 7,500 sqm Technology Center located in the Milan area. Sampsistemi intends to strengthen the capability to market and service Euroalpha, Euroalpha RM and Euro Extrusion product portfolio on a global basis, given the distinguishing, unique values of each product line and brand. The above-mentioned strategic initiative follows the earlier acquisition of Cortinovis do Brasil, a well-known and trusted player in the Brazilian and South American market, which has further strengthened Sampsistemi’s global platform by combining the companies’ decade-long experiences, and giving the distinctive ability to serve key markets with local support. SAMP USA plant in Williamsport, MD. Sampsistemi is a company of the Maccaferri Industrial Group, an international holding active in 6 main sectors, boasting a turnover of 1.2 billion Euro, 58 production plants and 4,600 employees worldwide.